Your favorite product: Multináramek from the skin and strings, and beads of steel and wood, skull with bones Y43.18 - is added to the wish list. 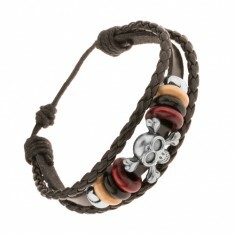 The bracelet on the arm - a dark leather belt with threaded beads of metal and of wood, steel skull with překříženými bones. Your favorite product: Multináramek from the skin and strings, and beads of steel and wood, the circle with the star Y44.03 - is added to the wish list. The bracelet on the arm - a dark leather belt with threaded beads of metal and wood, the five-pointed star in a circle of steel-gray color. Your favorite product: Multináramek from the skin and strings, and beads of steel and wood, skull with swords Y47.03 - is added to the wish list. 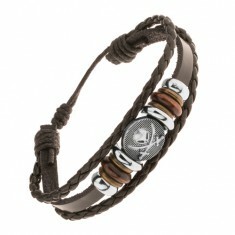 The bracelet on the arm - a dark leather belt with threaded beads of metal and of wood, steel skull with swords crossed. 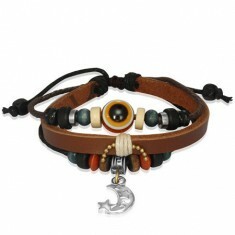 Your favorite product: Multi bracelet from leather and strings with balls and marigold O4.2 - is added to the wish list. 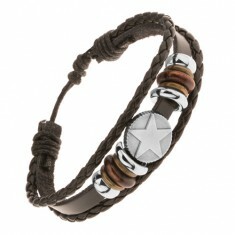 Bracelet from the leather belt and brown strings with beads and a moon with stars. Your favorite product: Leather Karma náramok with korálkami and čiernymi and bielymi šnúrkami AA02.29 - is added to the wish list. 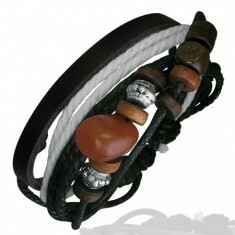 Leather bracelet with wooden rings, korálkou amber color, steel adornments and laces white and black colors. Leather náramok with drevenými krúžkami, bead jantárovej farby, oceľovými ornaments and šnúrkami bielej and čiernej farby. Your favorite product: White box for earrings and ring or pendant, red and pink heart Y33.7 - is added to the wish list. Gift box from paper to a piece of jewelry, a white surface dotted with red and pink hearts and outlines of hearts, pink bows. 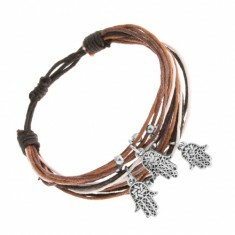 Your favorite product: Adjustable šňůrkový bracelet, brown, white and black color, beads and symbols Hamsa SP22.25 - is added to the wish list. Bracelet of black, white and brown šńůrek, decorative steel balls and three pendants - hand of Fatima. Your favorite product: Knitted bracelet made of brown, black and white cords, beads and peace symbols SP23.03 - is added to the wish list. 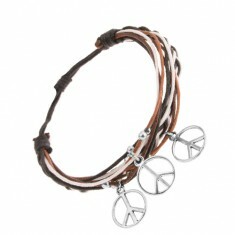 Adjustable bracelet, black, white and brown drawstring fastening, cable knit, decorative steel balls, and three charms - peace signs. Your favorite product: Šňůrkový bracelet black, white and brown colors, steel balls and crosses S11.25 - is added to the wish list. 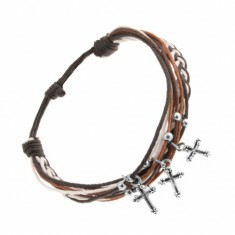 Adjustable bracelet made of black, white and brown cords, decorative steel balls, and three charms - antiqued crosses. Your favorite product: Adjustable bracelet brown, black and white color, the balls and the keys made of steel U3.11 - is added to the wish list. 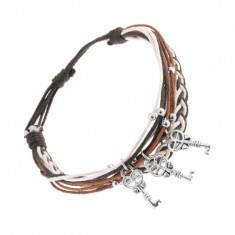 Šňůrkový bracelet in shades of black, brown and white colors, decorative steel balls, and three charms - a key with hearts. Your favorite product: Piercing to the belly of the bioflexu for pregnant women, "IT' - S AND BOY", "IT' - S AND GIRL" SP36.05 - is added to the wish list. A belly ring for pregnant woman, supple, and clear BioFlex, steel pendants - color banners "IT' - S AND GIRL" and "IT' - S AND BOY". Your favorite product: Piercing into the belly of a zircon and black and red feather F10.14 - is added to the wish list. Piercing to the belly with a flint and black and red feather. Your favorite product: A belly Piercing zircon and black and yellow feathers F10.12 - is added to the wish list. Piercing a belly button ring with clear zirconia and black-and-yellow feathers. Your favorite product: Hooked steel piercing in the chin and the lips with two balls, 4 and 5 mm SP01.26 - is added to the wish list. Piercing in the chin and lips of steel 316L, hooked up with a bigger and smaller ball, shiny surface. 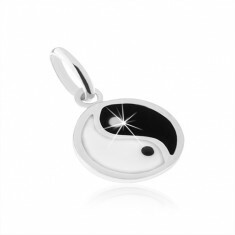 Your favorite product: Pendant of 925 sterling silver, black and white symbol of balance yin and yang SP56.20 - is added to the wish list. Silver pendant 925 - round symbol of yin and yang, black and white glaze, loop on the chain.